In the course of the past three decades, Adál Maldonado, known as ADÁL, has shifted his creative focus from introspective explorations into the human experience (love, relationships, family history, and self-identity), to more critical work that aggressively confronts issues of government control and exploitation. Since 1996, ADÁL’s artwork has dealt with the racial, political and economic status of Puerto Ricans living in the United States, particularly those in New York City. As ADÁL suggests, these "Nuyoricans" - a hybrid term that identifies the amalgamated Puerto Rican-living-in-New York experience - are incapable of fully integrating into the society in which they live because of their political and social status as quasi-citizens of the United States. ADÁL, in his two-part show in the cities of Cambridge and Boston, Massachusetts, explores these issues through visual and literary forms. 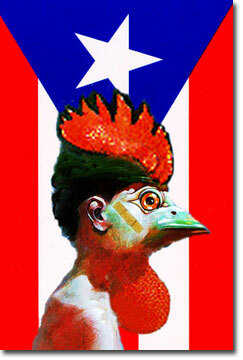 In 1996, ADÁL and the poet Reverendo Pedro Pietri, created a fictitious territory "10 degrees latitude just west of a place called Eden," and named it El Spirit Republic de Puerto Rico, a kind of sovereign utopia created as a political and artistic response to what ADÁL and Pietri felt was the US government’s disregard to the needs of Puerto Ricans, socially, culturally and politically. Parallel to the creation of the conceptual territory El Spirit Republic, El Puerto Rican Embassy was established, an organization through which ADÁL produces many of the typical documents used to certify the validity of El Spirit Republic de Puerto Rico and its citizens, including passports, stamps, currency. It is these documents that are on exhibition as "Blueprints for a Nation" at both the David Rockefeller Center for Latin American Studies and at the Center for Latino Arts. On the opening night of any Blueprints show, ADÁL sets up in the corner of the room, enacting a performance in which he produces passports for the exhibition’s guests, fulfilling dutifully his role as an Embassy employee. At DRCLAS a number of ADÁL’s photographic works were presented as a mini-retrospective of the artist’s career from 1974 to 2004. Curator José Luis Falconi chose to begin the show with ADÁL’s latest Blueprints for a Nation series, forcing the viewer to work backwards in order to fully understand ADÁL’s more recent endeavors. In the first sunroom-turned-gallery space of the small, brick building that is Harvard University’s DRCLAS, three blurred faces from ADÁL’s Los Out of Focus Nuyoricans Portraits series, a computer-generated passport-style group of portraits produced in 1995-96, were showcased above a bookshelf of pamphlets and publications promoting DRCLAS conferences that would surely discuss issues such as those ADÁL confronts in his art. The faces of Los Out of Focus Nuyoricans are captivating in their inability to be identified; their identity (and their social status) is withheld from the viewer so that one must accept their existence simply as people. ADÁL in fact removes a barrier by putting one up. We all have an inherent need to identify, understand and compartmentalize - these blurred faces force you to think about something else, let’s you get beyond that initial project of categorization, and to consider the bigger issues at hand. In this process of observation, the inability to categorize who these people may be becomes liberating, for both the viewer and the subject. And this is specifically ADÁL’s point. Embracing the "out-of-focus" reality of the Puerto Rican experience, and formulating a kind of pride and appreciation for their status as such is the artist’s key goal here.